Well placed on the historic Silk Road, Trabzon was a major trade center for centuries, attracting travelers and influenced by many religions, languages, and cultures. Aya Sofya is a striking Byzantine church similarly influenced, having morphed into a mosque, and later a museum, where impressive frescoes still decorate its walls. 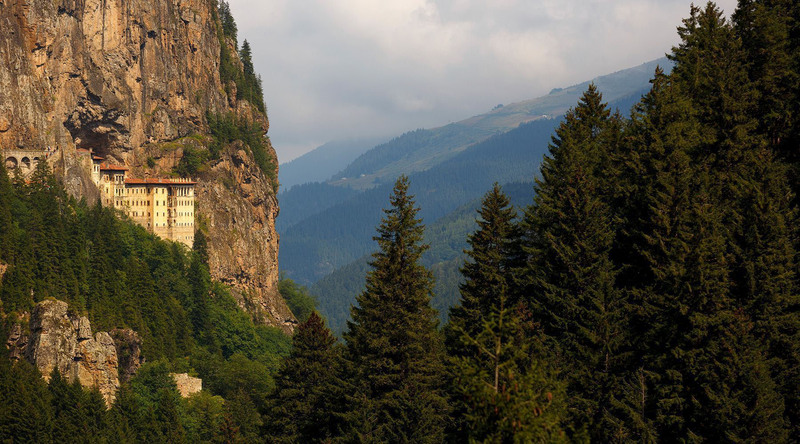 Perched dramatically on a narrow ledge of a sheer cliff in the nearby forest, is the rock-hewn Sümela Monastery, where according to legend two Athenian priests found a miraculous icon of the Virgin Mary in a cave. The cave became a Rock Church, and the monastery grew around it, expanding over the centuries. Trabzon has lived under the reign of many civilizations throughout centuries, which can be understood at Aya Sofya. This striking Byzantine building with beautiful frescoes inside, has been a church, museum, and mosque. This blindingly white mansion—now an interesting museum—features fine views and lovely gardens. Built for a wealthy Trabzon banking family, Ataturk Mansion was bequeathed to Mustafa Kemal Atatürk, the founder of the Republic of Turkey. Don't miss the unassuming study with a map of the WWI Dardanelles campaign scratched into a table. This tour takes you to the roots of Christianity in the Black Sea and to show you the grandeur of Sumela Monastery, famed worldwide for its location, rich history, and strategic importance.